After only 8 weeks of therapy a rider starts to make notable progress. Those that did not speak become move vocal, the socially impaired become more engaged, the ability to focus is greater, mobility is increased and cognition is improved. Consistency is the key to making sustained progress. That sustained progress can be directly linked to participation in ongoing equine therapy. 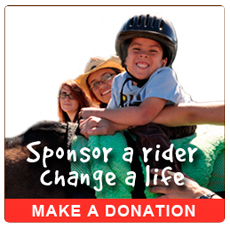 Through scholarship support of riders whose limited means may keep them from the therapy, your tax deductible donation has the power to transform lives. A rider begins to make progress after only 8 weeks of therapy. A $250 donation will give a child that chance. Imagine the progress after 16 weeks of therapy your gift of $500 will provide. $1,000 enables a rider to receive therapy for more than half a season which will sustain their progress. A gift of $1,500 will change a life forever by providing one whole season of therapy. Any amount great or small will go to help a rider to get the therapy from which they will benefit. Hoofbeats with Heart accepts credit cards through PayPal or mail a check to Hoofbeats with Heart, PO Box 2098, Higley, Arizona 85236. For Planned Giving Call 602-241-7718. The partnership between horses and humans is powerful medicine. Riding astride a horse has been recognized for more than fifty years for its significant physical and emotional benefits for persons with emotional, social, or psychological challenges. We are grateful for our special equine partners whose healing influence is never withheld from our clients. Your tax deductible sponsorship of a horse or equine services, will show your support for our program and these graceful horses that help to profoundly change lives. Sponsors will receive a thank-you banner on our website. Sponsors will receive a thank-you banner on our website and a name plaque, your horse’s photo and story.